An excellent hard bop trumpeter and Down Beat critics poll winner, Carmell Jones would probably have been much better-known today if he had not moved to Europe in the mid-’60s at the height of his career. Born July 19, 1936 in Kansas City, he started piano lessons at age five, trumpet lessons at age seven. He played with saxophonist NATHAN DAVIS for the first time then, later both played in the same Junior- and Senior High School Band. After military service and two years at the University of Kansas, Carmell attracted favourable attention for his trumpet playing in the Kansas City area. In spring 1960 he played in the band of pianist FRANK SMITH, together with alto saxophonist and Blues singer „CLEANHEAD“ EDDIE VISON. Carmell also led a group in Kansas City. Later he moved to LA, working as a studio musician. From 1960 to 1965 he was a member of the following groups, which performed either/and/or for television, records, motion picture soundtracks, concerts and various other functions: BUD SHANK, TEDDY EDWARDS, SHELLY MANNE, HAROLD LAND, HORACE SILVER, CURTIS AMY, BOOKER ERVIN, HOWARD RUMSEY’s LIGHTHOUSE ALL-STARS and many others. He also was a member of many Big-Bands and studio orchestras, which were led by GERALD WILSON, ONZY MATTHEWS, BENNY CARTER, NELSON RIDDLE, OLIVER NELSON, RUSSELL GARCIA, QUINCY JONES, AL PORCINO and many others. Carmell played and/or recorded with artists such as SAMMY DAVIS JR., BOB HOPE, FRANK SINATRA, ELLA FITZGERALD, COUNT BASIE, RED MITCHELL, BUDDY COLLETTE, VI REDD, JOE HENDERSON, VICTOR FELDMAN (1962), SARAH VAUGHAN, NANCY WILSON and JIMMY WOODS (1963), and most significantly as a member of the GERALD WILSON ORCHESTRA (1961-63). He also performed with many other orchestras in Eastern- and Western Europe including the USSR, and appeared in two movies, ‚The Seven Days In May‘ and ‚The Manchurian Candidate‘, the latter starring Frank Sinatra. In 1964 he went to New York to play with the HORACE SILVER QUINTET, recording the original version of ‚Song For My Father‘ – he also recorded with HERBIE MANN and CHARLES MC PHERSON. Until June 1965 Jones toured with Silver and in August he moved to Europe, where he would stay for the next 15 years. At a concert in Germany in August `65, Carmell met Nathan Davis again, and one day after, Nathan´s album ‚Hip Walk‘ was recorded. In Berlin he joined the SFB (Radio Free Berlin) BIG-BAND and SYMPHONIC ORCHESTRA (1965-80), led by PAUL KUHN, and played regularly with studio orchestras. He performed at several Jazz-Festivals, like the International Jazz Festival Prague, the 10th German Jazz Festival Frankfurt with ANNIE ROSS and PONY POINDEXTER (both 1966) and at the Berlin Jazz Days with OLIVER NELSON (1970). Carmell also recorded with JEAN-LUC PONTY (1969), LEO WRIGHT (1972) and the JAY MC SHANN BAND (1979) and composed and arranged for recordings, radio, TV and movies. In his spare time, Carmell led his own big band, they appeared on a television series, produced by Steve Allen. In June of 1980 he returned to Kansas City, except for a short European tour with RAY CHARLES. In his hometown he taught at several Junior and Senior Highschools, appeared with local groups and played at the Hyatt Regency. 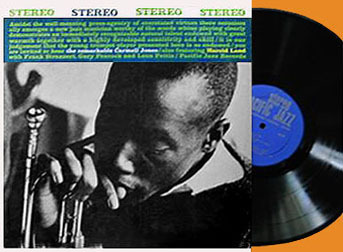 Jones made a couple of albums as a leader: ‚The Remarkable Carmell Jones‘ (1961) and ‚Business Meetin´ (1962), both for Pacific Jazz, ‚Jay Hawk Talk‘ (1965) for Prestige, and Carmell Jones Returns in 1982 for Revelation. His last recorded notes are on JIM MAIR´s 1991 album ‚8th And Central‘. He passed away November 7, 1996 in Kansas City at the age of only 60 years. Carmell William Jones, born July 19, 1936, was raised in Kansas City/ Kansas. His unusual Christian name comes from a Spanish word meaning ‘song’. Actually, he´s got some Spanish and some Red Indian blood. He always wanted a trumpet as a small boy. Although his parents were poor, they were badly paid teachers in Kansas City, they managed to enable Carmell music lessons: piano lessons started at age five, the trumpet lessons started at age seven. His father, a professional drummer once (Carmell used to play around on his kit), hoped he would play the sax and was pretty upset when he held out for a trumpet. When Carmell was eleven his mother scraped together the money to buy him a second-hand cornet for Christmas. He joined the school bands and it was while he was playing in one of the marching bands that he discovered jazz on the radio. His father was even more annoyed when Carmell declared that he intended to become a professional musician. Mr. Jones had plans for his son to go into engineering … but he respected that Carmell had a mind and will of his own and encouraged him to study music seriously. He also only 7 years old when he played with saxophonist NATHAN DAVIS for the first time. They are old buddies. Both are from Kansas City and spent the most important years of their musical and human education together, their entire adolescence. Both have played in the same Junior and Senior Highschool-Band when they were youngsters. Carmell graduated from High School in 1954. At university, when Nathan was still blowing trombone (! ), he organized Jazz concerts all over Kansas City and Carmell was his favorite trumpet player. Because there was no work at home during that time, Carmell joined the U.S. Air Force, spending four years with the 501st Air Force Band at the Hickham Air Force Base in Hawaii, where he played with BILLIE HOLIDAY, and led his own quintet. So Carmell and Nathan were separated when they joined the Army and then lost sight of each other. After his discharge, Carmell returned home and enrolled at the University of Kansas, intending to take a music degree, majoring in music education and trumpet. In 1959 he took part in the annual collegiate jazz festival at Notre Dame, Indiana. The antiquated teaching methods at University frustrated him so much that, after two years, he quit and started working as a steward (another source says he worked as a railway porter) on sleeping cars between Kansas City and Chicago. 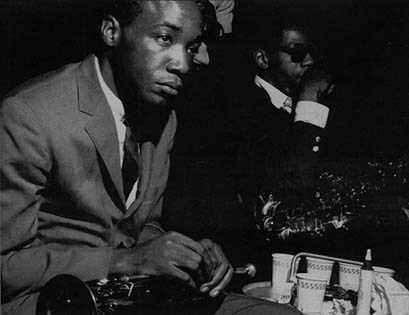 In Spring 1960 Carmell, played at a club called ‚Mardi Gras‘ in Kansas City in the band of pianist FRANK SMITH – together with alto saxophonist and Blues singer „CLEANHEAD“ EDDIE VISON. He also led a group in Kansas City. After being well reviewed by the German Jazz critic Joachim-Ernst Berendt (who had heard Jones while in Kansas City in 1960) he moved to California in the same year, working as a studio musician. 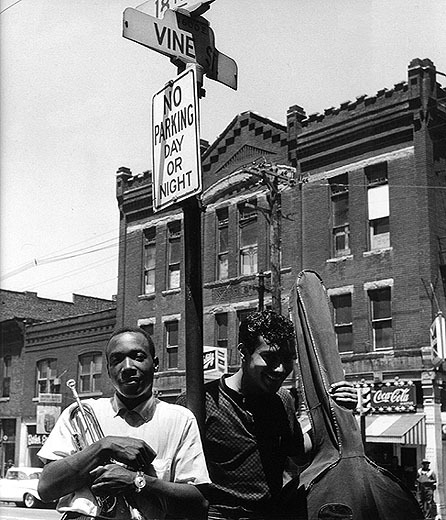 Carmell with Charles Matthews in Kansas City, 1960, photos © William Claxton. There he met such West Coast stars as SHELLY MANNE, TEDDY EDWARDS, BUDDY COLLETTE and BUD SHANK. 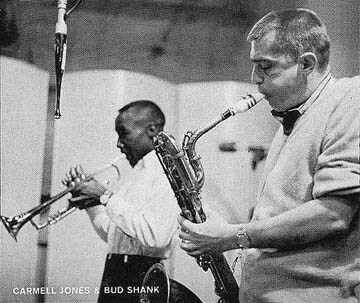 In Los Angeles in 1961, Jones joined saxophonist BUD SHANK for an engagement at the ‚Drift Inn‘ in Malibu. With Shank he also recorded the album ‚New Groove‘ in May at the World Pacific Studio, with guitarist DENNIS BUDIMIR, bassist GARY PEACOCK and drummer MEL LEWIS. 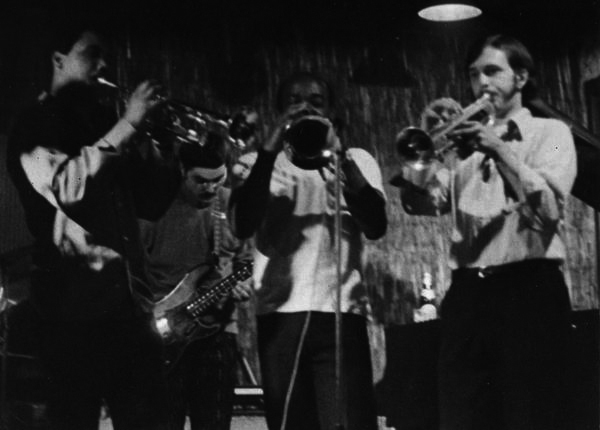 The same year Carmell recorded his first album as a leader for Pacific Jazz: ‚The Remarkable Carmell Jones‘ with tenorist HAROLD LAND, pianist FRANK STRAZZERI, bassist GARY PEACOCK and LEON PETTIS on drums. (The album was reissued by the British Charly label on their Affinity subsidiary in the mid-’80s). The record has sold well and Carmell was able to quit his day job as a railroad porter. 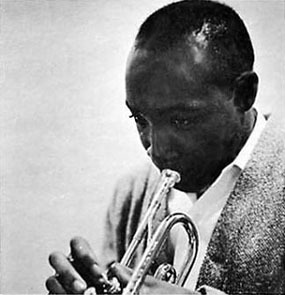 In September/October of 1961 Carmell played on trumpeter GERALD WILSON´s album ‚You Better Believe It‘ (Pacific), together with a 17 piece orchestra, featuring the Jazz organ of RICHARD „GROOVE“ HOLMES, with AL PORCINO, JOHN AUDINO, JACK TRAYNOR, RAY TRISCARI and JAMES ZITO on trumpets, LESTER ROBINSON, KENNY SHROYER, JOHN EWING, FRANK STRONG and BOB EDMONDSON on trombones, BUDDY COLLETTE (cl, fl, as), HAROLD LAND, WALTER BENTON, TEDDY EDWARDS, JOE MAINI and DON RAFFEL on tenors, HARRY KLEE on alto, JACK NIMITZ (bs), guitarist GENE EDWARDS, bassist JIMMY BOND and MEL LEWIS on drums. Carmell during his very first recording session with Bud Shank for ‚New Groove‘ in May 1961. 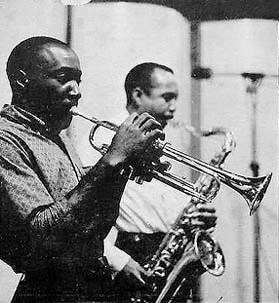 Carmell and Harold Land during the recording for ‚The Remarkable Carmell Jones‘ in 1961. On October 14, he recorded ‚Hear Ye! Hear Ye! Hear Ye!‘ with The Red Mitchell – Harold Land Quintet (Atlantic), featuring: RED MITCHELL on bass, HAROLD LAND on tenor, FRANK STRAZZERI and drummer LEON PETTIS. The album was reissued in 1967 by Atlantic as ‚… And Keep On Swinging‘. Carmell also played on tenorist CURTIS AMY´s ‚Groovin‘ Blue‘ (Pacific), with BOBBY HUTCHERSON on vibraphone, FRANK STRAZZERI, JIMMY BOND on bass and FRANK BUTLER on drums. (World Pacific), BUD SHANK´s original soundtrack to Bruce Brown’s surfing documentary, in LA, with BUD SHANK on alto and baritone, BOB COOPER on tenor, DENNIS BUDIMIR on guitar, GARY PEACOCK on bass and SHELLY MANNE on drums. The next year Carmell made his second album ‚Business Meetin‘ (Pacific) with CLIFFORD SCOTT (who appears under the pseudonym JOE SPLINK), BUD SHANK, HAROLD LAND, WILBUR BROWN on tenor, DON RAFFEL on baritone, FRANK STRAZZERI, bassists GARY PEACOCK and LEROY VINNEGAR and drummers RON JEFFERSON and DONALD DEAN. Carmell at the session for ‚Business Meetin´‘ in 1962. He also recorded ‚Brass Bag‘ for Pacific, with trombonists TRICKY LOFTON, FRANK STRONG, BOB EDMONDSON, WAYNE HENDERSON, KENNY SHROYER and LOU BLACKBURN, FRANK STRAZZERI, bassist LEROY VINNEGAR and drummer RON JEFFERSON, arranged by GERALD WILSON. 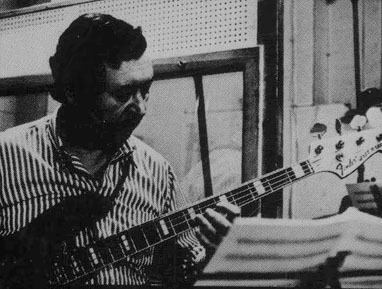 – ‚The Victor Feldman All Stars Play The World’s First Album Of Soviet Jazz Themes‘ (Ava) VICTOR FELDMAN on vibraphone, piano and key- board, NAT ADDERLEY on cornet, HAROLD LAND, HERB ELLIS on guitar, JOE ZAWINUL on piano, BOB WHITLOCK on bass and FRANK BUTLER on drums. The tacks were tunes that Feldman heard from tapes made on the Benny Goodman trip to Moscow in 1962. 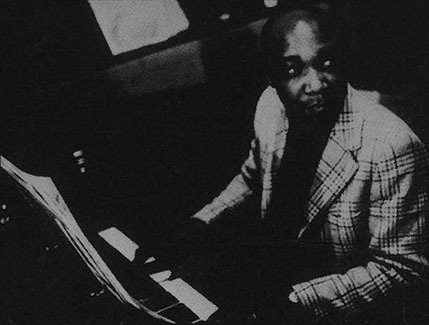 RUSS FREEMAN on piano, ROY AYERS on vibraphone, HERB ELLIS, LEROY VINNEGAR (or BOB WHITLOCK?) on bass and RICHIE GOLDBERG on drums. It was reissued as ‚Bird Call‘ on the Solid State label. – ‚Moment Of Truth‘ by the GERALD WILSON BIG BAND (Pacific) was recorded in August/September in Hollywood, with trumpeters AL PORCINO, JULES CHAIKIN, JOHN AUDINO and FRED HILL, trombonists BOB EDMONDSON, LOU BLACKBURN, FRANK STRONG, KENNY SHROYER, BOB KNIGHT and LES ROBERTSON, tenorists TEDDY EDWARDS and HAROLD LAND, JOE MAINI on alto, DON RAFFEL, JACK NIMITZ (reeds), flutist BUD SHANK, pianist JACK WILSON, guitarist JOE PASS, bassist JIMMY BOND, drummer MEL LEWIS and MODESTO DURAN on congas, arranged and conducted by GERALD WILSON. Carmell during the session for Gerald Wilson´s ‚Moment Of Truth‘. Pictured above, left to right, back row: Carmell Jones, Nat Meeks, Jules Chaikin, Al Porcino, Freddie Hill; second row: Don Switzer, John Ewing, Bob Edmondson, Modesto Duran; (standing) Gerald Wilson; front row: Harold Land, Teddy Edwards, Jimmy Woods, Joe Maini, Jack Nimitz at the December 2, 1963, session. Photo by Woody Woodward, courtesy of the Cynthia Sesso Archives. 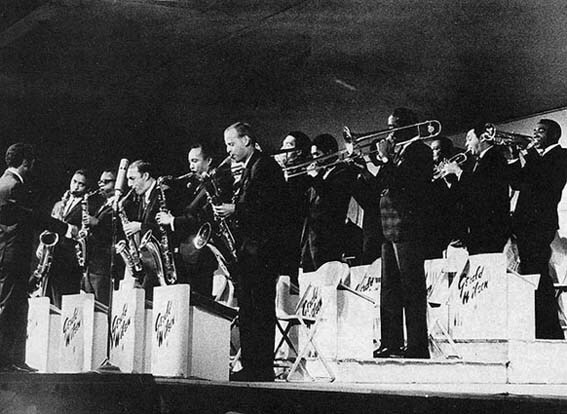 The Gerald Wilson Orchestra, Carmell on the right side. In March 1963 Carmell appeared on the album ‚Conflict‘ by the Jimmy Woods Sextet (Contemporary), featuring: JIMMY WOODS on alto, HAROLD LAND, ANDREW HILLE on piano, GEORGE TUCKER on bass and ELVIN JONES on drums. On June 6 he recorded on SARAH VAUGHAN´s ‚Sarah Sings Soulfully‘, her final Roulette session before going back to Mercury and one of her best, arranged by GERALD WILSON with tenorist TEDDY EWARDS, organist ERNIE FREEMAN and drummer MILT TURNER. – ‚Yesterday’s Love Songs, Today’s Blues‘ by NANCY WILSON (Blue Note), recorded in October 8 & 10 in Los Angeles, arranged by GEALD WILSON, with the Gerald Wilson Orchestra: AL PORCINO, JULES CHAIKIN, FRED HILL, BOB EDMONDSON, JOHN EWING, LESTER ROBERTSON, KENNY SHROYER, PAUL HORN, TEDDY EDWARDS, HAROLD LAND, DON RAFFEL, JOE MAINI, JACK WILSON, WILD BILL DAVIS, JOE PASS, JIMMY BOND and KENNY DENNIS. – ‚Jazz Impressions Of Folk Music‘ (Imperial) by The Harold Land Quintet recorded in December with HAROLD LAND (ts), JOHN HOUSTON (p), JIMMY BOND (b) and MEL LEWIS (dr). 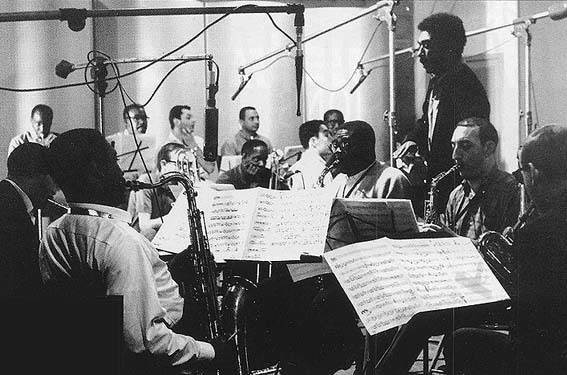 ‚Portraits‘ by the GERALD WILSON ORCHESTRA (Pacific), was recorded on December 2, 1963 and January 8, 1964 at the Pacific Jazz Studios in Hollywood, besides Carmell with: AL PORCINO, RAY TRISCARI, NATHANIEL MEEKS, FRED HILL and JULES CHAIKIN on trumpets, BOB EDMONDSON, JOHN EWING, DON SWITZER, LESTER ROBINSON, LEW MC CREARY on trombones, JOE MAINI, JIMMY WOODS on alto, TEDDY EDWARDS, HAROLD LAND on tenor, JACK NIMITZ (bs), BUD SHANK (fl), JACK WILSON (p), JOE PASS (g), LEROY VINNEGAR and DAVE DYSON on bass, CHUCK CARTER (dr) and MODESTO DURAN (bgo), arranged and conducted by GERALD WILSON. On October 2, he played on tenorist BOOKER ERVIN´s ‚Groovin´ High‘ (Prestige) with pianists JAKI BYARD and GILDO MAHONES, bassist RICHARD DAVIS and drummer ALAN DAWSON. 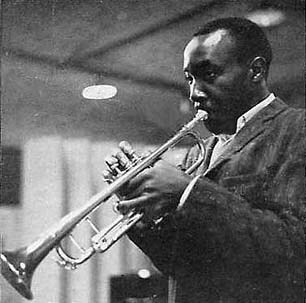 In 1964 he was elected „New Star Trumpeter“ in Down Beat critics poll, then, after turning down the chance of going with Art Blakey’s Jazz Messengers, he went to New York to become a member of the HORACE SILVER QUINTET. ‚The Horace Silver Quintet Live 1964‘ (Emerald) was recorded June 6 at the Cork & Bib in New York City, with JOE HENDERSON on tenor, TEDDY SMITH on bass and ROGER HUMPHRIES on drums. From the cover of ‚Conflict – Jimmy Woods Sextet‘, 1964. From the booklet of ‚Song For My Father‘, 1964; Carmell and Joe Henderson. Carmell played on BOOKER ERVIN´s ‚The Blues Book‘ (Fantasy / Prestige) on June 30, 1964 with pianist GILDO MAHONES, bassist RICHARD DAVIS and drummer ALAN DAWSON. 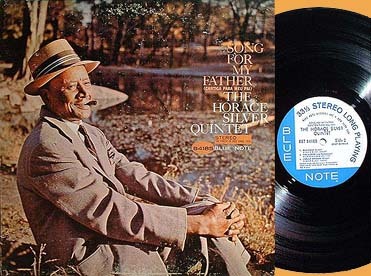 The original version of ‚Song For My Father‘ (Blue Note) was recorded on October 26, 1964 with HORACE SILVER on piano, JOE HENDESON on tenor, TEDDY SMITH on bass and ROGER HUMPHRIES on drums. Some of the recordings also appear on ‚Silver’s Serenade‘ and ‚Horace Silver Best Album‘. JIMMY HEATH on tenor, DAVE PIKE on vibraphone, CHICK COREA on piano and WILLIE BOBO on drums, arranged and conducted by OLIVER NELSON. On November 20, 1964 he recorded with altoist CHARLES MC PHESON ‚Bebop Revisited !‘ (Prestige) along with BARRY HARRIS on piano, NELSON BOYD on bass and drummer ALBERT „TOOTIE“ HEATH. 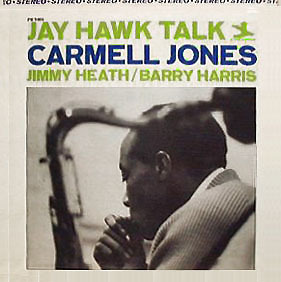 In May 1965 Carmell recorded his third studio album ‚Jay Hawk Talk‘, for Prestige, in New York City, with JIMMY HEATH on tenor, BARRY HARRIS on piano, GEORGE TUCKER on bass and drummer ROGER HUMPHRIES. ‚Jay Hawk Talk‘ included one of Carmell’s personal favo- rite compositions, ‚Stellisa‘, named after his daughter, who was named after his mother Stella and his niece – Lisa. The album has been re-released on Fantasy/Original Jazz Classics. Besides Jones´ first album ‚The Remarkable Carmell Jones‘, it´s his only recording as a leader which has been re-issued on CD until now. The Emerald label released a live recording of HORACE SILVER, called ‚Re-Entry‘, recorded April 16, 1965 and February 18, 1966 at the Half Note in New York City, besides Carmell with: WOODY SHAW (tp), JOE HENDERSON (ts), LARRY RIDLEY, TEDDY SMITH (b) and ROGER HUMPHRIES (dr). Carmell stayed with Silver until the summer of 1965, touring until June of 1965 with Silver (after, Woody Shaw took his place), then he felt he needed a change, because the New York scene was stifling him and he was becoming disenchanted with things in the States. In August he moved to Europe. 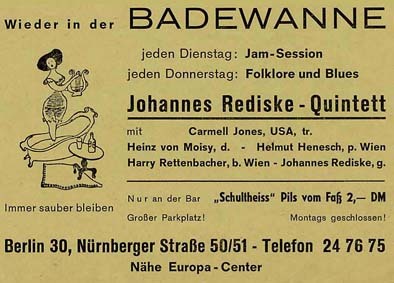 As result of his success in the States, Carmell was invited by Joachim Berendt, the German jazz critic who had heard Jones in 1960 while in Kansas City, to go to Germany to perform and record. He would stay for the next 15 years. 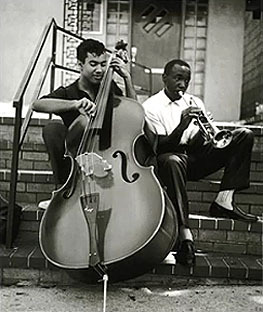 Carmell and Nathan wanted for years to play together again, at the Saba concert at the Beethoven Hall in Stuttgart, in August 1965, that re-encounter took place of which both had dreamed for years. One day after, September 1, 1965, NATHAN DAVIS´s album ‚Hip Walk‘ was recorded in Villingen/Germany for Saba/MPS, featuring: FRANCY BOLAND, JIMMY WOODE and KENNY CLARKE. Then it was on to Berlin, where he joined the SFB (Sender Freies Berlin = Radio Free Berlin) Big Band and Symphonic Orchestra from 1965-1980; he had a contract as trumpet soloist, staff arranger and composer, music consultant, etc. 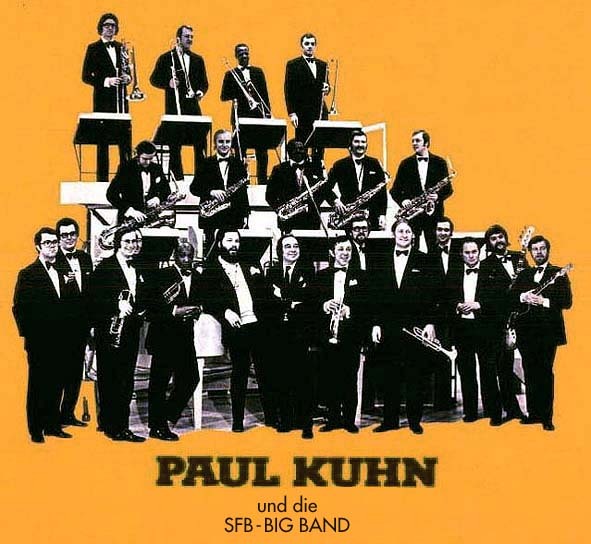 Besides traveling around the world with that band, led by PAUL KUHN, Carmell played regularly with studio orchestras, he was recording, composing and arranging for recordings, radio, TV and movies. In his spare time, and led his own big band. Carmell would have liked to establish hisself in America as a musician, composer and arranger, but for the moment he was very happy living in West Berlin and playing with Leo Wright in the SFB Radio Orchestra. 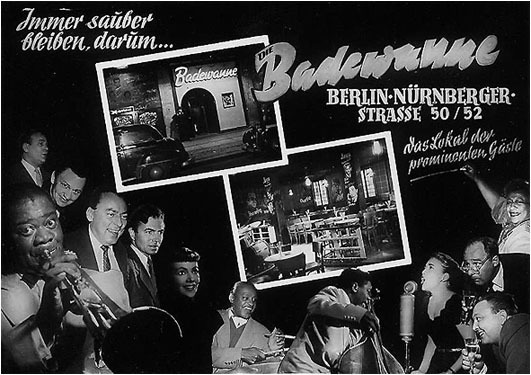 Both also performed at Berlin´s clubs, like Dug’s Night Club, where they jammed on new years eve 1965, with ÅKE PERSSON (tb), BOOKER EVIN (ts), FRITZ PAUER (p), unknown (b) and (dr). SFB radio station broadcasted the session. 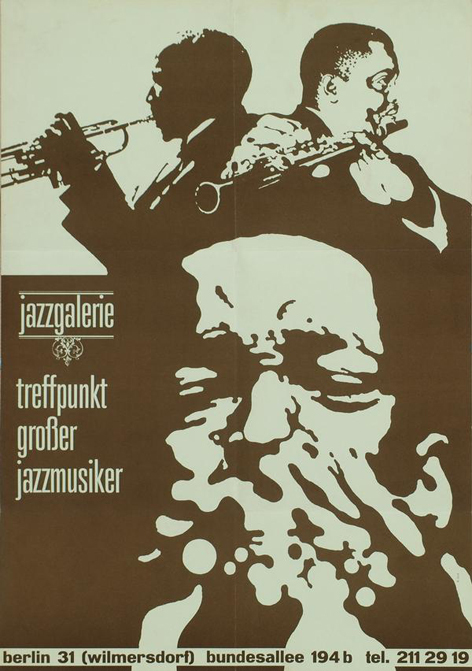 Carmell Jones on flugelhorn at the Jazzgalerie in Berlin January 18, 1971. Jam at the Jazzgalerie Berlin (l-r) Ted Murdock, Bud Fadale, Carmell Jones, Larry Brown Jr. In 1966 Carmell performed at the International Jazz Festival Prague, one year later the Czechoslovakian label Supraphon released a compilation, entitled ‚International Jazz Festival Prague `66‘, recorded live at Prague Jazz Festival at Prague´s ‚Lucerna Hall‘, among the artists were: ARNE DOMNERUS (as), RUNE GUSTAFFSON, THE PAUL BLEY TRIO, JOHN DANKWORTH QUINTET /w CLEO LAINE (voc), THE MANFRED SCHOOF QUINTET /w GERD DUDEK, GEORGE RIEDEL SEPTET, ALEXANDER VON SCHLIPPENBACH, JEAN-LUC PONTY, PIERRE FAVRE; TONY CARR, KAREL RUZICKA and a group led by CARMELL JONES. On May 1, 1966 he performed with Annie Ross & Pony Poindexter at the 10th German Jazz Festival Frankfurt, the German label Saba/MPS released a live album of the concert: At The 10th German Jazz Festival Frankfurt – Annie Ross & Pony Poindexter with the Berlin All Stars‘ with singer ANNIE ROSS, PONY POINDEXTER on alto, soprano and vocals, altoist/flutist LEO WRIGHT, pianist FRITZ PAUER, guitarist ANDRÉ CONDOUANT, bassist JIMMY WOODE and JOE NAY on drums. Carmell performed together with LEO WRIGHT (as, fl), HELMUT BRANDT (bs), FRITZ PAUER (p), ANDRÉ CONDOUANT (g), DIETER GÜTZKOW (b) and JOE NAY under the pseudonym of „THE BERLIN ALL STARS“ at Berlin´s Sportpalast on November 5, 1966, the show was broadcasted by SFB radio station. In June 1967 Carmell made his only visit to Britain, where he played at the ‚Club 43‘. He enjoyed it a lot: the atmosphere was free and the people were lovely. He was as impressed by the scene there as Leo was. Back in Berlin, Carmell performed together with the DON ELLIS BERLIN DREAM BAND featuring: ACK VAN ROOYEN, RON SIMMONDS, HARRY SAMP, DON ELLIS (tp), HENRY MASNICK, JEAN ORIEUX, ÅKE PERSSON, SIEGFRIED SCHMIDT (tb), unknown tuba, LEO WRIGHT, KLAUS MARMULLA (as), LOTHAR NOACK (ts), DOMINIQUE CHANSON (ts, fl), HELMUT BRANDT (bs), DAVE HOLDINGER (clavinet, marimbaphon, xylophon, perc), FRITZ PAUER (p), JÜRGEN EHLERS, HAJO LANGE (b), DAI BOWEN, HEINZ NIEMEYER, WERNER WINDLER (dr, perc) and the PETER CORNEHLSEN CHOIR at the Philharmonie, Berlin, on November 8, 1968, SFB radio broadcasted the show. On January 9, 1969 Carmell Jones played at Vienna´s Austrophon Studio with the ERICH KLEINSCHUSTER SEXTET: ROBERT POLITZER (tp, fl-h), ERICH KLEINSCHUSTER (tb), HANS SALOMON (as, ts, b-cl), FRITZ PAUER (p), JIMMY WOODE (b) and ERIC BACHTRÄGL (dr), the show was broadcasted by ORF radio. The same year Prestige released his album ‚Carmell Jones In Europe 1965-66‘ with NATHAN DAVIS, LEO WRIGHT and PONY POINDEXTER (sax), FRANCY BOLAND and FRITZ PAUER (p), ANNIE ROSS, ANDRÉ CONDOUANT, JIMMY WOODE, KENNY CLARKE and JOE NAY on drums. Invitation for an exhibition at Evelyn Künnecke´s gallery in Berlin. The same year, in 1969, he played on JEAN-LUC PONTY´s album ‚More Than Meets The Ear‘ (Liberty), with PONTY (v), LEO WRIGHT on alto and flute, pianist GEORGE GRUNTZ, who also did the arrangements, DANIEL HUMAIR on drums, and an unidentified bassist. Ponty was barely 26 at the time of this recording, his first to appear on an American label, but he already was a very original player. LEO WRIGHT, KLAUS MARMULLA (as, fl, cl), ADI FEUERSTEIN, ROLF RÖMER (ts, fl), JAN KONÒPASEK (bs, b-cl), FREDDY L´HOST (cl), KAI RAUTENBERG (p), HAJO LANGE (b), DAI BOWEN and HEINZ NIEMEYER (dr, perc). 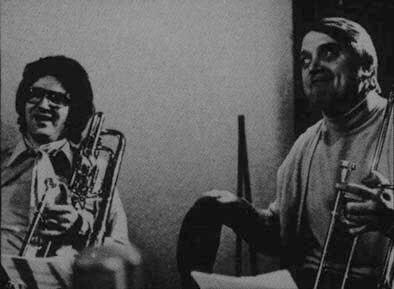 In 1972 Carmell played on LEO WRIGHT´s album ‚It´s All Wright – Leo Wright Plays 12 All-Time-Hits‘ (MPS/BASF), recorded between February 26 and March 5, at Sono-Press Studio in Berlin, with trumpeters MILO PAVLOVIC, ACK VAN ROOYEN and ROLF ERICSON, trombonists ÅKE PERSSON, SLIDE HAMPTON, CHARLES ORIEUX and LOU BLACKBURN, pianist EUGEN CICERO, organist LOU BENNETT, guitarists PIERRE LOUIS and INGO KRAMER, JEAN WARLAND on electric-bass, drummer TONY INZALACO and PETER LEWISON and DAI BOWEN on percussions. It was arranged and conducted by JERRY VAN ROOYEN, and produced by GÜNTER HENNE. Also in 1972, the German label MPS planned to release a recording, entitled ‚Carmell Jones Quintet‘, but it never came out. Unfortunately further information is not available yet. From the backcover of Leo Wright´s LP ‚It´s All Wright‘, left pic from left: Milo Pavlovic, Ack van Rooyen and Carmell Jones, right pic: Charles Orieux with Åke Persson. Left: Jean Warland, right: Carmell Jones. More photos can be seen on Leo Wright´s and Lou Bennett´s pages. Like Davis, Carmell has played, although at different times, with the JAY MC SHANN BAND, the orchestra that followed Count Basie’s and Bennie Moten’s Kansas City tradition, and brought forth Charlie Parker. 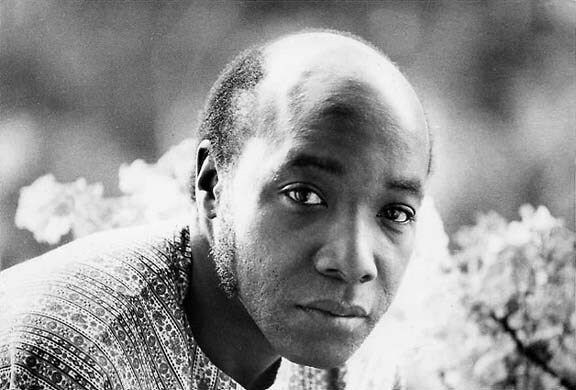 In 1979 he performed on pianist JAY MC SHANN´s ‚Paris All-Star Blues: A Tribute To Charlie Parker‘, issued in 1992 by Music Masters, along with TERENCE BLANCHARD and CLARK TERRY on trumpets, AL GREY on trombone, BENNY CARTER and PHIL WOODS on altos, JAMES MOODY, HAL SINGER and JIMMY HEATH on tenors, JIMMY WOODE, singer ERNIE ANDREWS, and TONY RUSSO, SAHIB SHIHAB, MARC STECKER, CLARK TERRY, ERNIE WILKINS, JIMMY WILKINS and MEL LEWIS. Carmell returned to Kansas City in June of 1980 and remained in his hometown, except for a short European tour with RAY CHARLES. He taught music privately, appeared with local groups, and played at the Hyatt Regency. In October 1982 he made his last album ‚Carmell Jones Returns‘ (Revelation), with ROLAND BURNS on alto, FRANK SULLIVAN on piano, SCOTT WALTON on bass and BILLY BOWKER on drums. College of Kansas City. The very last album, Carmell Jones appeared on was JIM MAIR´s ‚8th & Central‘, which was recorded in 1991, together with JAMES BALL (tb), PAT MORRISSEY (fl-h), FRANK SMITH (p), TIM WHITMER (p), EVERETTE DE VAN (org, synth), RICHARD ROSS (voc), FRIAN HARMAN (g), MILT ABEL, BOB BOWMAN (b), TOMMY RUSKIN (dr) and CHICO BATTAGLIA (cga, perc). Carmell was influenced by every kind of music he ever heard, from pop to classics – every musician he ever met or heard has affected him musically. He knew that things of value from others would help him to find his true inner self and to express himself honestly. Armstrong, Eldridge, Dizzy, Miles, Clifford Brown and Fats Navarro on the one hand, and Ravel, Bartok, Stravinsky, Beethoven and Brahms on the other have influenced him most. 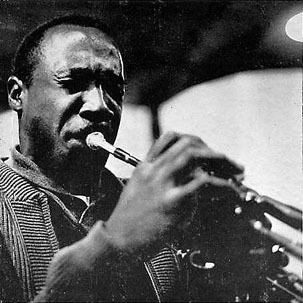 In the music he recorded in the ’60s Jones displayed an affinity with Clifford Brown. 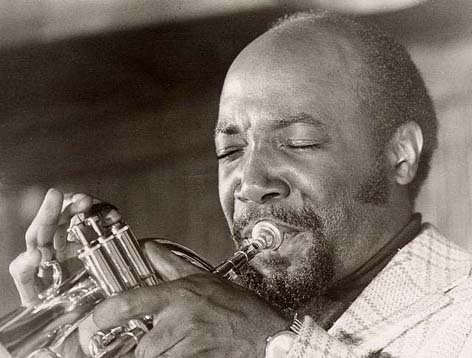 Although very active in Europe, Carmell Jones was largely forgotten, but his return to the US Jazz scene in 1980 showed that in maturity he had developed into an accomplished player, who deserved a wide audience. His 1982 album for Revelation helped remind listeners how good he still was. Carmell passed away November 7, 1996 in Kansas City at the age of only 60 years. 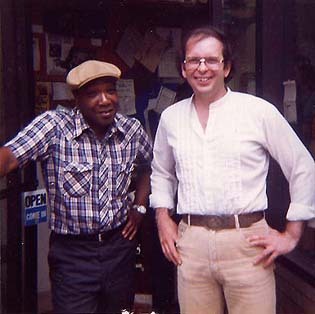 Carmell and Larry Brown Jr., around 1982. THANK YOU SO MUCH, LARRY !!! for providing material and sharing stories. Bobby Dorr, fender bass; Siegfried Strauss, guitar. This outstanding band was heard on SFB (Sender Freies Berlin = Radio Free Berlin) from the mid-60ies. The band played under the direction of pianist and arranger Paul Kuhn from 1968 until its disbandment in 1980. 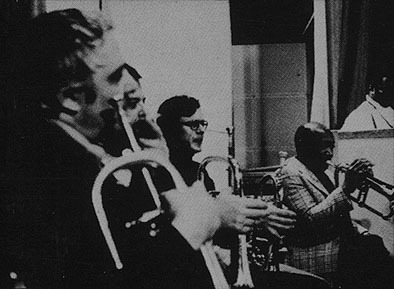 Many famous players worked with the band, including: Slide Hampton, Bob Burgess, Torolf Mølgaard, Herb Geller, Rolf Ericson, Carmell Jones, Benny Bailey, Åke Persson, Al Porcino, Ron Simmonds, Milo Pavlovic, Heinz von Hermann, Leo Wright, Eugen Cicero, Ack van Rooyen, Jerry van Rooyen, Joe Harris and Ronnie Stephenson. The band performed with many stars, like Shirley Bassey, Oscar Peterson, Gilbert Bécaud, Jerry Lewis, to name just a few.